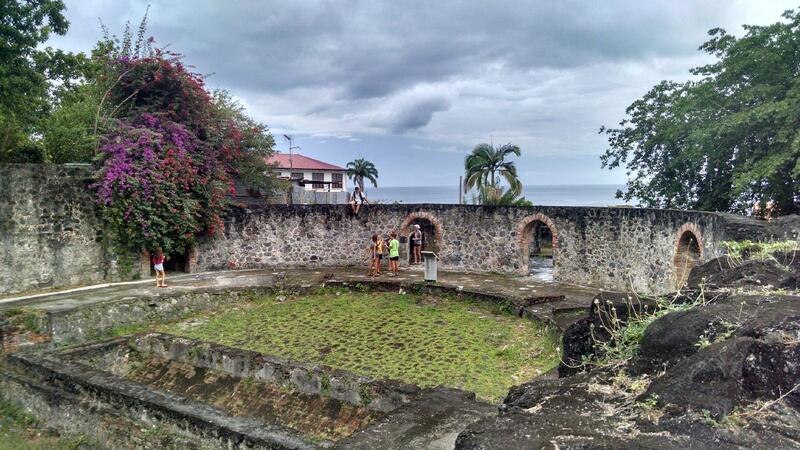 Picture St. Pierre it in its glory days of 1902: stone buildings, red-tiled roofs, lush tropical foliage. At 28,000 people, it was the largest city on Martinique, the largest city in the French West Indies, the largest city in the Windward Islands. It had culture, rich residents (sugar plantation owners, traders, bankers), rich visitors, famous visitors (e.g., painter Paul Gaugin). People called it the "Paris of the Caribbean" The harbor was often full of ships carrying passengers or loading sugar, rum, chocolate, tobacco, fruits, spices. About four miles north was the 4800' Mt. Pelee, a dormant volcano. Ant/centipede invasion is followed by a mass migration of snakes including the deadly Martinican pit viper. Earthquakes, explosions, and dense black smoke began occurring every 5-6 hours. Farm animals in rural areas began dying from lack of food and water due to heavy ash penetration. Pelee seems to calm for hours. Suddenly the sea recedes 330' and then rushes back, flooding the town. away from the town. 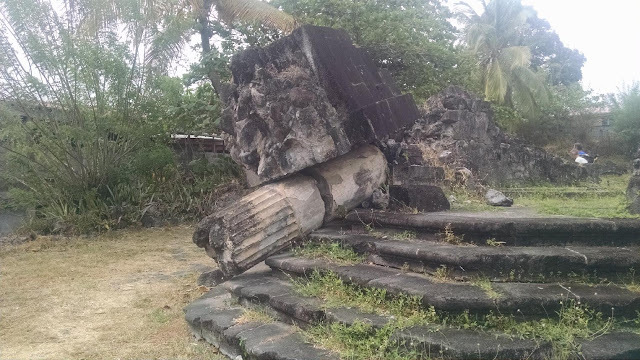 The governor and his wife, who lived in Fort de France 20 miles to the south came to town to reassure residents that there was nothing to fear. Mt. Pelee's crater wall collapses, overflowing a local river with boiling mud, burying a sugar refinery and 150 people in boiling mud. "Atmospheric disturbance" brings down the electric grid, plunging the city into darkness. Bolts of volcanic lightning strike continually around the mountain peak in the thick, dark, volcanic ash cloud. This is creepy. Run, people. Seriously. It's the end of times. 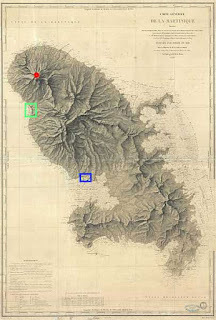 Some residents of the city did leave - more than could fit on the departing ships, and some attempted to flee to Fort de France to the south. The governor felt that this was not appropriate and deployed troops to keep people from fleeing. A cargo captain decided to haul anchor and leave. He faced vigorous protests from sugar merchants, refusal of the port authorities to clear him out, and threats of arrest, but leave he did. He was the smart one of course. 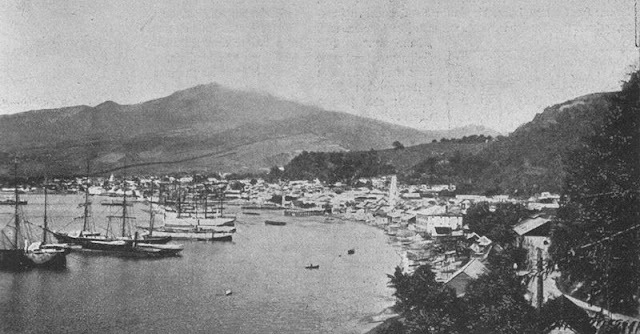 Many residents from the surrounding area fled to the town for safety, swelling its population to around 30,000. 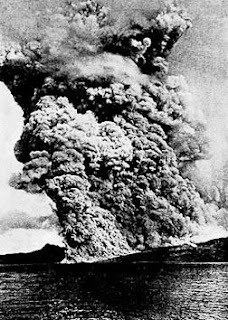 The eruption of May 8, 1902. A little before 8:00 AM on May 8, 1902, Mt. Pelee blew. The SW side of the cone glowed red and then exploded horizontally, sending a blast cloud hugging the ground towards St. Pierre at over 400 mph. If you were in St. Pierre when you saw this, it was too late for you. This cloud - swift, dense, black, glowing red inside - must have looked incredibly evil. The force of the blast leveled most buildings. The cloud's temperature was almost 2000 degrees Fahrenheit. Many residents were found swollen and burned to death even though their clothes were intact. Those residents it didn't kill instantly with impact or heat were killed by lack of oxygen or poison gases. St. Pierre burned for days. put the cell in a "shadow"
Out of the 30,000 people in St. Pierre, there were only two known survivors. 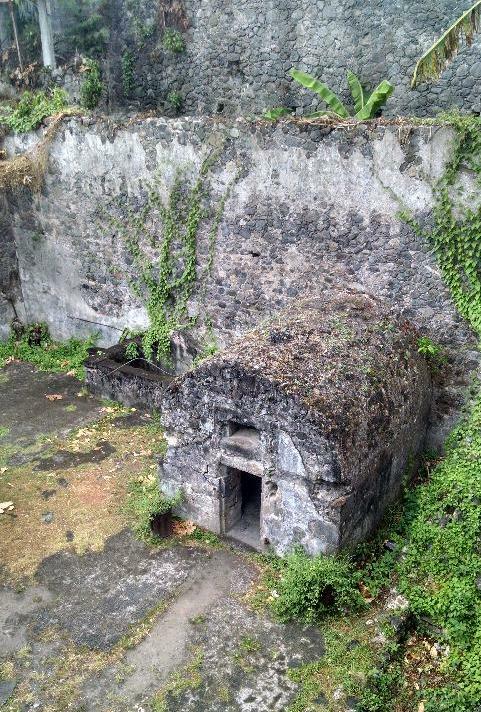 One, Louis-Auguste Cyparis, was a prisoner in a stone cell, which offered him a great protection from blast and heat. By virtue of his survival, he was pardoned and became world-famous touring with Ringling Brothers' Circus. It is not known how the other man survived. The eruption of Mt. Pelee acquainted scientists with a volcanic phenomenon they called a Nuee Ardente, which though literally means a "glowing cloud", came to mean a flow of very hot gases mixed with small particles and large chunks that is fluid enough to flow over ground effects as happened with Mt. Pelee. This eruption was the first Nuee Ardente on record. 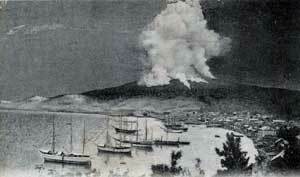 Over twenty ships were destroyed in the harbor in this eruption. One ship, the Rodham, escaped even though most of the crew was dying or dead. When the ship arrived in St. Lucia, stunned customs officials asked them where it had come from. "From the gates of hell" was the captain's response. This cathedral had only a few good years; it was completed in 1899. Ruins of the theater. Photo taken from on stage,looking out onto main seating level with entry (arches) behind. There was also balcony seating above main and box seat along each side. 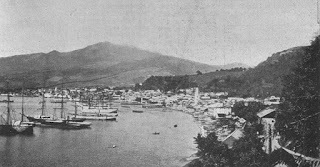 St. Pierre in 1902 before the eruption. 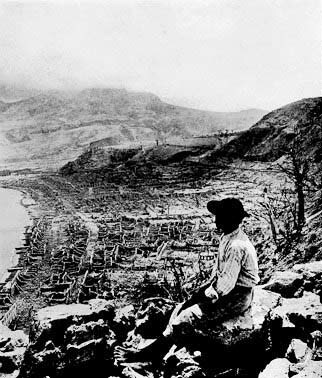 St. Pierre in 1902 after the eruption.